CO-WORKING 24 offer memberships that provide access to multiple CO-WORKING 24 spaces, meeting venues, and educational and social events. Whether you are an independent, an entrepreneur building a startup, a small business owner or a corporate innovator, CO-WORKING 24 is a place to imagine and pursue what’s possible. In a pleasant view and open work environment you gain flexibility to your working schedule and the chance to interact with other motivated coworkers leading to a innovative and creative community. Flexible or fixed workstations, space for events and seminars, a lounge to meet or relax, free internet access, wi-fi and national calls is offered. The use of printer, scanner and locker is of course a given. There is also a small kitchen with an espresso machine, a kettle, a fridge and a microwave. ​A pleasent place to work and great community to work with. Co Working 24 is a dream accelerator — a destination for building your venture and exploring new ideas in the company of other creators. We offer memberships that provide access to multiple Co Working 24 spaces, meeting venues, and educational and social events. Whether you are an independent, an entrepreneur building a startup, a small business owner or a corporate innovator, Co Working 24 is a place to imagine and pursue what’s possible. Flexible or fixed workstations or private cabins, space for events and seminars, a lounge to meet or relax, free internet access, wi-fi and video conference equipped meeting rooms are offered. The use of printer, scanner and locker is of course a given. There is also a small kitchen with an espresso machine, a kettle, a fridge and a microwave. The Co Working24 co-working space used as your virtual office, you can get your postal mail sent to our address. Community or individual, half day or full day, daily, weekly or monthly - there's an option for you and if not, let's speak about it. From Rs. 499/- for a day, Rs.  3,999/- monthly for the all-day community or Rs.5,999/- for the individual full day desk or Rs.6,999/ for a private cabins. Designers, architects, software engineers, web workers, translators, all feel equally well here and work together. You're not alone? Special prices if you come accompanied, and special prices if you stay more than six months. And if you're not sure if Co Working24 is your space, try it for free one day. CO-WORKING 24 is a place to explore your dreams, build your venture and prosper.